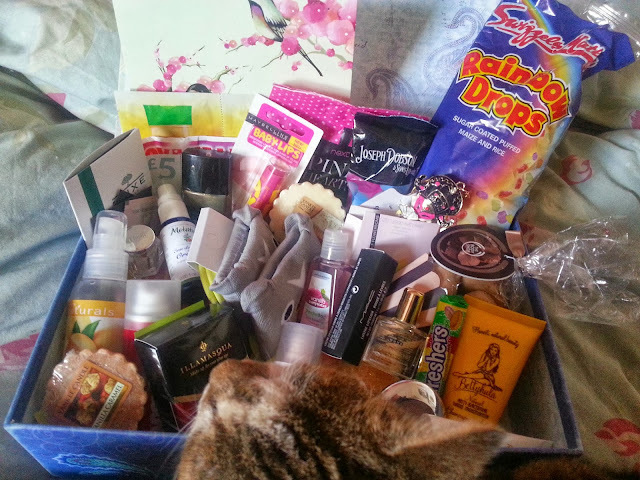 As you can see, Lolly the Grumpy Kitty decided she wanted to get involved with photo taking so please excuse the massive head n the foreground :P There was such a great variety of things in this box, just looking makes me excited. Nichola put a fab selection of sweet treats into the box. 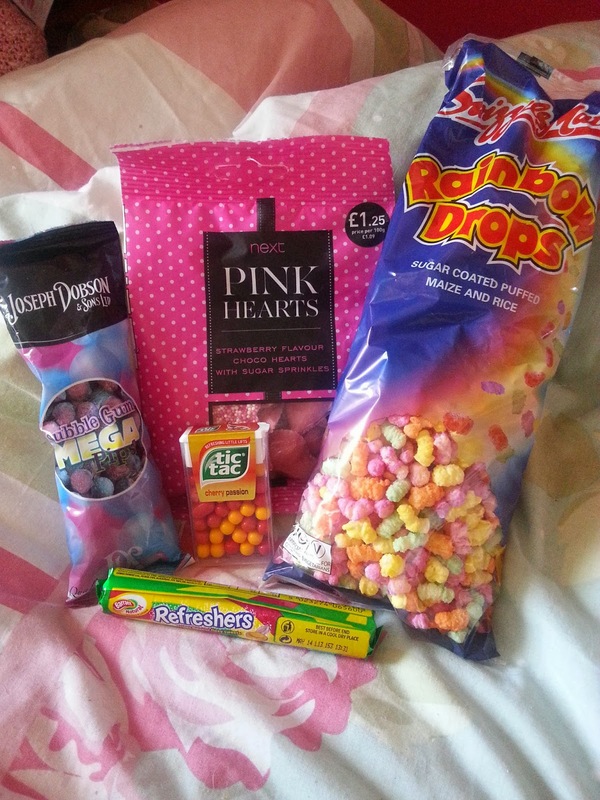 There was also a melody pop and a love hearts dib dab...they got eaten before I took the photo though. I made a best friend very happy by taking the rainbow drops over when we had a girly evening. Just throwing this out there, but these socks are loved a CRAZY amount. They remind me of what I think a Minecraft owl would look like. 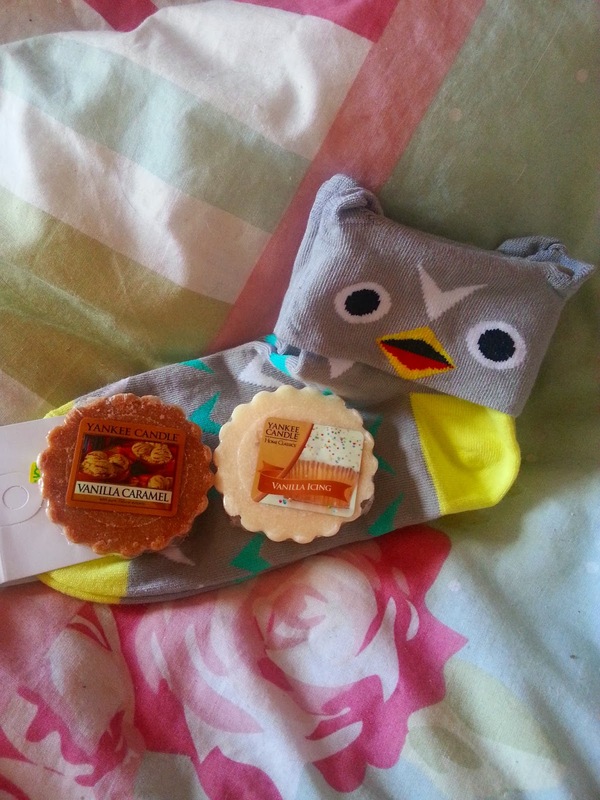 And also how thoughtful to pick up something owly because of my little obsession :) The Yankee tarts are gorgeous foodie scents and because they're discontinued scents I'm really going to treasure using them. Skincare is one of my favourite things, I love trying out new products and if you read my post yesterday then you'll already know that since trying the Nuxe goodies, I have fallen in love with them. 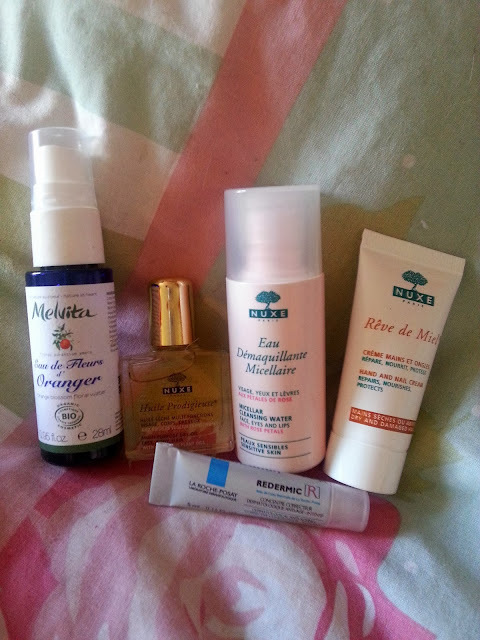 I haven't used the La Roche Posay or Melvita yet because I have so much on the go but they both also sound amazing. 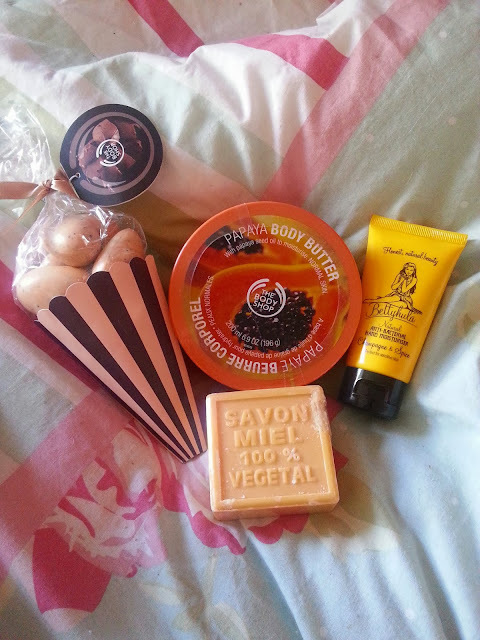 Next up was some body products to keep me feeling beautiful all over. The square soap was brought back from Nichola's holiday which I thought was a lovely touch, it has a lovely clean, honey scent and as soon as I've finished up th bar I'm using (which fittingly is a big version of the little Body Shop Chocomania hearts here) I will be moving on to this. 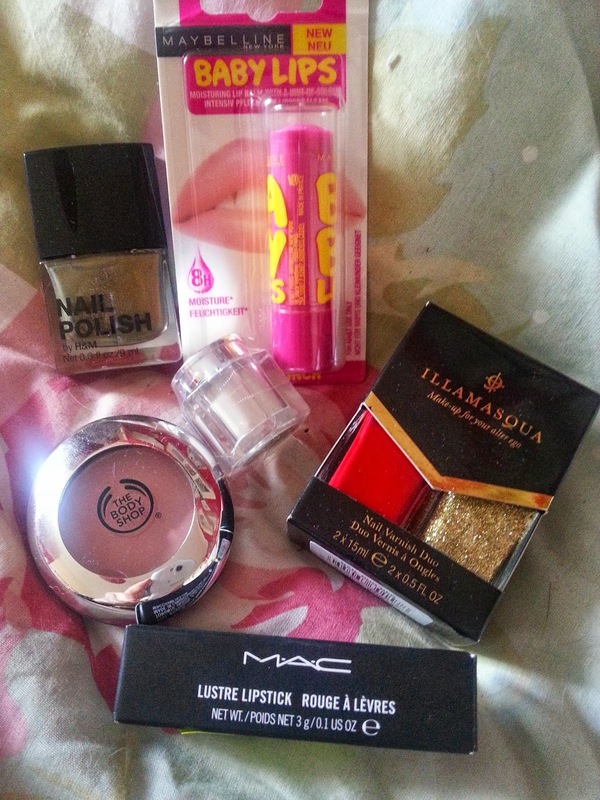 What excited me most out of these products though was the Betty Hula Anti-bacterial Hand Cream which is scented with champagne and spice. I haven't used Betty Hula products before and this smells and feels divine on my skin. 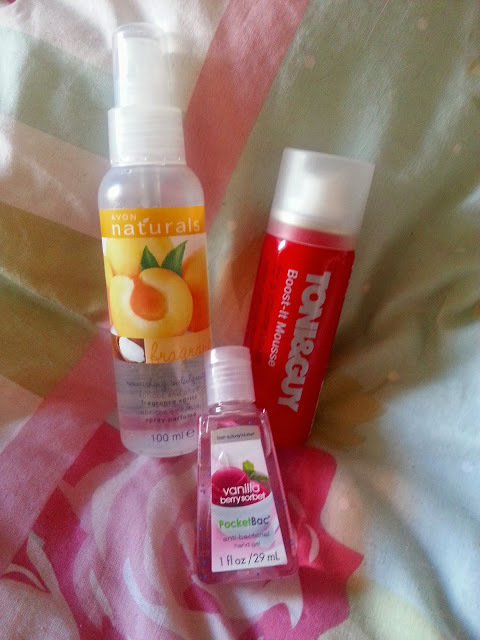 These three were popped straight into my handbag for their sheer usefulness. I was so excited to see the Bath and Body Works mini sanitiser in the box because I haven't had the chance to try the range before and I've heard so many amazing things, and I haven't been disappointed- it smells delicious! The peach body spray has a lovely scent too, very sweet and fresh which is perfect for a midday pick me up. I am a very lucky lady! Wow!!! 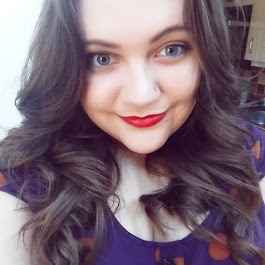 Drainedbeauty and I are doing a blog swap for Christmas, this has gave me so many ideas!